If our auto mechanics determine you need car repair services that you would need financing for, Guaranteed Automotive & Transmission Service Lafayette, IN offers NAPA EasyPay Financing. We understand that everyone is in different financial positions. Our top priority is to keep our clients safe on the road. If that requires assistance with financing options, we’re happy to help. 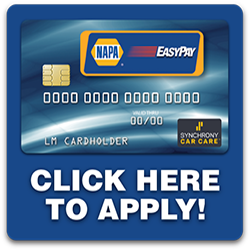 To learn more about NAPA EasyPay, we encourage you to contact us.